The Finnish blockbuster World War II drama, UNKNOWN SOLDIER (Tuntematon sotilas, 2017) by Aku Louhimies expands its international scope into Baltics after having the most successful run of a Finnish film in Sweden in the past decade, On June 5th the film’s international cut was screened to a crowd of invited guests in Tallin, Estonia, in the presence of director Louhimies and actors Eero Aho, Juho Milonoff, Arttu Kapulainen, Andrei Alén and Kimi Vilkkula, before opening in cinemas across Estonia. UNKNOWN SOLDIER, an adaptation of the 1954 best-selling World War II novel of the same name by Finnish author Väinö Linna, follows a platoon of Finnish soldiers in the battlefields over the course of three years during the Continuation War between Finland and the Soviet Union. The war epic was initially released in Finland in October 2017, and has gained over 1 000 000 admissions in Finnish theatres, becoming the most succesful Finnish release since the launch of contemporary statistics. 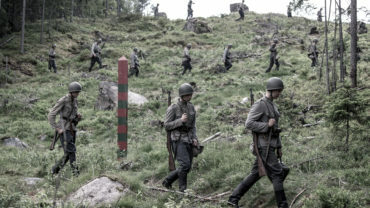 Being the first Finnish film to be distributed in Sweden by SF Studios in its 98-year history, UNKNOWN SOLDIER succeeded in attracting more than 68,000 admissions making it the most successful run for a Finnish film in its neighbouring country for the past ten years. During Winter and Spring 2018 UNKNOWN SOLDIER has also opened in Denmark, Norway and Iceland. UNKNOWN SOLDIER was produced by the Aku Louhimies, Mikko Tenhunen, and Miia Haavisto for Elokuvaosakeyhtiö Suomi 2017 (Finland), in co-production with Kvikmyndafélag Íslands (Iceland) and Scope Pictures (Belgium) and was supported by the Finnish National Broadcasting Company YLE and the Finnish Film Foundation. International sales agent for both the feature film and the 5 part TV series is Beta Cinema. Aku Louhimies is an award-winning director and screenwriter. Over the last decade his highly acclaimed, commercially successful films have established him as one of the most preeminent directors of Scandinavian cinema today. His previous production prior to Unknown Soldier was Rebellion, a five-part serial drama for Ireland’s National Television and Radio Broadcaster RTÉ and Netflix. See production details on IMDB.